When a book title is as long and descriptive as this one is, I feel no need to be creative in my post titles. In her introduction to the book (which is also brilliant), Shange shares the story of how the work evolved. She describes it as a "choreopoem," in which many individual pieces come together to form one statement. She also talks about how the work has resonated with so many people across cultural and societal lines. It's not only performed by African-American women. It was also adapted by white women in Appalachia to talk about the class system. It was done in Brazil. It was done with an all-male cast. It's been adapted in so many ways, by so many people, and it was so moving to hear Shange describe how amazing it is to have created a work that touches people so deeply. I also loved, loved, loved Shange's thoughts on feminism and how she wrote the work for women. When men decry it as being anti-Black male, they are turning something very personal to women to something about themselves, which is not what Shange intended or wanted at all. 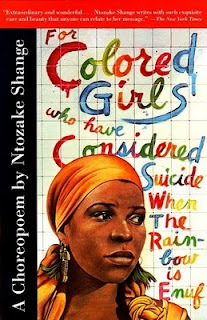 It was so enlightening to read and I have a serious literary girl-crush on Shange. There is no real plot to for colored girls. It doesn't need one. It's a series of poems that describe such a range of situations and emotions and experiences that I can't imagine reading this only one time. It's the sort of work you read and you just know if you read it again in a few years, you'll get even more out of it, or what will resonate with you then will be so completely different than what you got out of it this time. I'm so disappointed that I didn't read this book until I was 30. I feel like 20 year old me would have gotten a lot out of it, too. I did this as an audiobook, and it was amazing. I surprisingly really enjoyed hearing all the stage directions and notes in the play. I also enjoyed listening to the poems. As I found out when listening to Make Lemonade, it is less intimidating to approach long-form poetry through audiobook than through written form. That said, I do think this is a book I will want to read physically. I want to savor the words and linger over phrases, dogear the pages and copy down quotes. It is a book that I am excited to read again, and I hope that all of you who haven't read it yet will pick it up - I am sure it will resonate with you just as it did with me. I read this book in college and didn't really get it. I think rereading it now as a 30-something would be good for me. I read this in college and found it amazing. Now I'm thinking maybe I should go back and read it again. I just checked this book out from the library a few weeks ago and now it's sitting on my shelf. I had no idea that it was a series of poems. Thanks for writing this post. I saw this performed several years ago, when I was teaching high school. I remember that some of the pieces were quite moving--I suspect that the ones that didn't impress me had as much to do with the performance--the high school girls who performed it were generally very good, but not consistently so. Interesting that they read out the stage directions in the audiobook. One of my favorite playwrights (Tarell Alvin Mccraney) writes the stage directions into the script so that characters speak them. It amazes me how affective and non-distracting that is. I think I would really, really enjoy this, and had no idea it even existed. Thanks yet again for adding to my TBR (TBListenedTo?) I also quite like the idea of the stage directions being read out loud in the audiobook. I did a fair bit of theatre in high school and always loved hearing the actors reading their stage directions in read-throughs. Had forgotten about that until just now. I share your crush on Shange, especially over this book. And yes, it has certainly been rewarding to reread it over the years. Not all of us have had all the experiences the actors describe, which be off-putting, but rereading passes off. We all need to listen to each other. Melissa Harris Perry has a very good discussion of this book in her Sister Citizen. Based on your review I think even an almost 50 year old woman will get something out of this one. I'd love to have my book club read something like this but not sure if I can get them off the light literature kick they have been on lately.